SEATTLE (Oct. 4, 2018) — Group fundraising solution Snap! 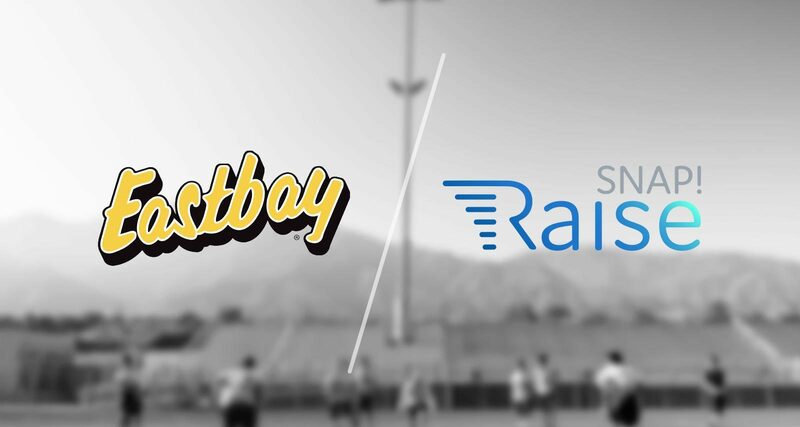 Raise is excited to announce a new partnership with athletic retailer Eastbay. Through this partnership, Snap! Raise and Eastbay will double down on the mission they share to support youth sports teams and educational programs by providing the resources they need to achieve more, all while saving valuable time and energy for coaches, educators, parents, and students. Youth activities, athletics and educational programs continue to face the growing need for additional support. Snap! Raise uses industry-leading social donation technology and expert customer care to help programs leverage the support of their communities. A substantial volume of the funds raised for youth activities, especially in the athletics segment, are put directly toward purchasing group apparel. Eastbay provides easy accessibility to an unparalleled selection of the best performance products available from Nike, Jordan, adidas, Under Armour, and many more. Ultimately, this partnership allows both companies to align in helping schools and youth sports programs of all types meet their needs on an unprecedented scale. “Our mission is to provide coaches and group leaders with the valuable time and resources needed to impact their students. Adding a partnership to our hands-on approach to fundraising allows us to further our ability to transform the youth activities space and to better serve our customers,” Snap! Raise, Co-Founder and CEO Cole Morgan said of the new partnership. Snap! Raise and Eastbay will begin rolling out the program in Fall of 2018. Working together, the nationwide companies will provide even greater value and exclusive opportunities to athletic and activities programs across the country. Snap! Raise is the leading fundraising solution for youth athletics and extracurricular programs. Since its first fundraising campaign in 2014, Snap! Raise has facilitated hundreds of millions of dollars in donations for programs elementary school through high school nationwide, from athletics, to the arts, to academics, and beyond. It is the mission of Snap! Raise to provide a seamless, data-driven process that helps programs achieve their fundraising goals, saving time, energy, and resources for kids, coaches, educators, and supporters. Since 1980, Eastbay has been dedicated to supporting athletes with the unrivaled selection of athletic gear, casual styles, and training expertise they need to win both on and off the field. As a member of the Foot Locker, Inc. family, our focus is on inspiring high school athletes around the world to become strong leaders and contributors to their teams, schools, and communities. Because our mission isn’t just about delivering more brands, styles, colors, and sizes of athletic gear than anyone in the industry – it’s about helping athletes go For The Win in everything they do.